The Second Global Congress on Verbal Autopsy convenes October 14-16, 2013, in Rhodes, Greece. 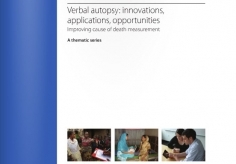 By assembling researchers, policymakers, and national and multi-national health organizations, the Second Global Congress on Verbal Autopsy aims to promote debate, discussion, and innovation that significantly advance verbal autopsy instruments, analytic methods, and applications in health information systems. Co-hosts include the Institute for Health Metrics and Evaluation, University of Washington; University of Melbourne School of Population and Global Health; and Population Health Metrics. The First Global Congress on Verbal Autopsy was held in 2011 and served as an important mechanism for discussion, collaboration, and advancement of the field of verbal autopsy. A wide array of participants attended, and there was great interest in making the Congress a recurring event. Learn more about the 2011 Global Congress on Verbal Autopsy: State of the Science, by downloading the resources provided below.